NBC and other outlets have reported that the agency recently concluded that Saudi Crown Prince Mohammed bin Salman ordered the murder of journalist Jamal Khashoggi. 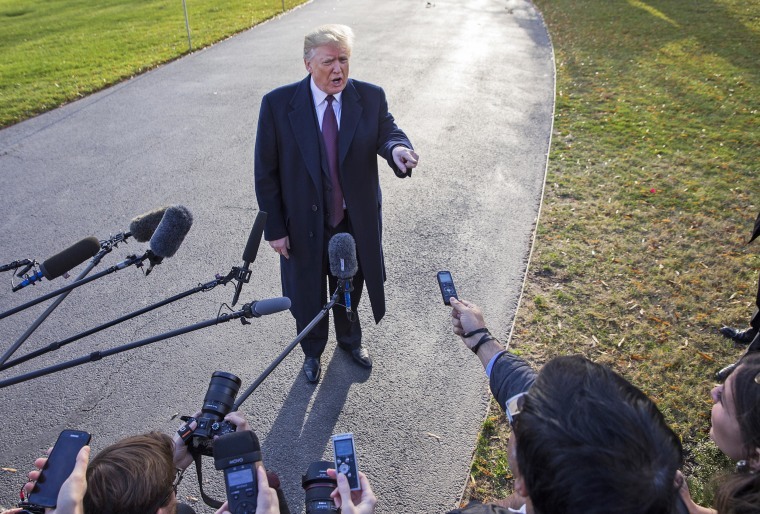 WASHINGTON — Responding to questions about Saudi Arabia's role in the murder of Washington Post journalist Jamal Khashoggi, President Donald Trump suggested Thursday that the U.S. can't afford to punish foreign nations for killing people. "Do people really want me to give up hundreds of thousands of jobs?" he said. "And frankly, if we went by this standard, we wouldn’t be able to have anybody who’s an ally, because look at what happens all over the world." NBC and other outlets have reported that the CIA recently determined, reportedly with "high confidence," that Saudi Crown Prince Mohammed bin Salman ordered the murder of Khashoggi at a Saudi consulate in Turkey in early October. Trump rejected that characterization in an exchange with reporters in Palm Beach, Fla., where he is spending the Thanksgiving holiday at his Mar-a-Lago resort, but said the American relationship with Riyadh wouldn't be affected even if the crown prince is responsible for Khashoggi's death. "Whether he did or whether he didn’t, he denies it vehemently," Trump said. "The CIA doesn’t say they did it. They do point out certain things, and in pointing out those things, you can conclude that maybe he did or maybe he didn’t." "I hate the cover-up. And I will tell you this, the crown prince hates it more than I do," he said. "And they have vehemently deny it. The CIA points it both ways. As I said, maybe he did, maybe he didn't. But I will say very strongly that it's a very important ally." By design, intelligence community analyses don't reach conclusions. Instead, analysts provide evidence and a degree of confidence about their judgments, along with information about any uncertainties. Pressed Thursday on whether his message to foreign leaders is that they can act with impunity, Trump said "no." "Not at all," he said. " Saudi Arabia has been a longtime strategic partner. They're investing hundreds of billions of dollars in our country. I mean hundreds of billions. They're keeping the oil prices low." The U.S Bureau of Economic Analysis does not report figures for Saudi Arabia's direct investment in the U.S. to avoid revealing information about specific companies. While overall data is not available, the office of the U.S. Trade Representative reports that "Saudi Arabia's direct investment in the U.S. is led by real estate, information services, and retail trade." Financial transactions between the two countries amounted to a negative number in 2017 — about $161 million in Riyadh's favor — according to BEA. Saudi Arabia spent about $9 billion on U.S. arms between 2013 and 2017, according to the Stockholm International Peace Research Institute, but Trump has said erroneously that Saudi rulers are ready to spend many multiples of that in the coming years — up to $450 billion in goods, including $110 billion in military equipment. Saudi Arabia's annual gross domestic product has been below $700 billion in each of the last three years.